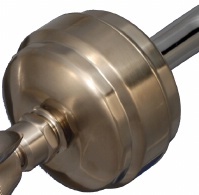 RECONDITIONED Solid metal Brushed Nickel Slim-Line shower filter without a showerhead. Filter lasts roughly 6 months. Choose this option if you already have a showerhead you like or want to add a Oxygenics showerhead. Excellent Condition Like New.